Periscope software displays the screen of a Windows Mobile SmartPhone or Pocket PC onto a desktop or laptop PC for projection, remotely controls PowerPoint presentations and remotely manages files and programs on devices. Full screen display on black background for maximum impact and colour PowerPoint thumbnails on Windows SmartPhone and Pocket PC for confident presentations. Periscope is excellent for training clients and colleagues on the new mobile solutions for business. Periscope is also an 'Over The Air' (OTA) tool for management of remote Windows Mobile Smartphones. Periscope software is complimentary with all purchases of Mobile Data Studio software and can also be accessed for an unlimited Trial. Periscope 3 includes support for WVGA, VGA and QVGA screen resolutions, secure connection to distant Windows Mobile devices over 3G/4G, simplified wireless connection, management of files, device registry and tasks, and faster response time. Real-time projection of a SmartPhone or Pocket PC screen - the projected image changes as the Windows Mobile device is operated. Remote control a PowerPoint presentation from a SmartPhone or Pocket PC with full support of thumbnail previews, notes and drawing. Screen image in WVGA, VGA and QVGA resolutions is scaled up to provide a crisp, clear image that's easy for an audience to read for high impact presentations. Connect using a wireless LAN leaving the presenter free to move about, or via the mobile phone system to service a remote device, or connect with a wired TCP/IP link or ActiveSync and Mobile Device Centre. Many display configurations for full-screen presentations or to use alongside a laptop presentation or slides. Interactive mode, to operate the Smartphone or Pocket PC remotely, for 'over the air management' of the Smartphone. 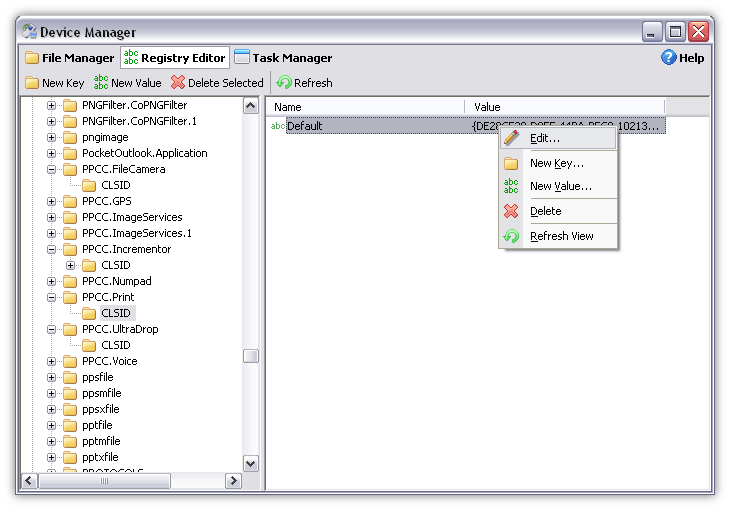 Manage key aspects of a Windows Mobile device using File Manager, Registry Editor and Task Manager. Before Periscope can be used to project a Windows Mobile Smartphone or Pocket PC's screen, or remotely control PowerPoint, Periscope must be installed onto the Windows Mobile device and started/opened. To install Periscope, connect the Smartphone or Pocket PC to the client desktop or laptop PC and establish an ActiveSync or Mobile Device Centre (in Vista) connection. Once a connection has been established, select Install Periscope to Pocket PC and ActiveSync will install the Periscope software onto the Smartphone or Pocket PC. Periscope can also be installed on a Windfows Mobile Smartphone or Pocket PC by emailing or copying the Periscope.arm.CAB file in C:\Program Files\CreativityCorp Periscope\MobileSetup to a Windows Mobile device and tapping the file to open. After installation to a Windows Mobile Smartphone or Pocket PC is complete, Periscope appears as a link either as an item on the Windows Mobile Start menu or in Programs. Select Periscope and it will open at a screen prompting entry of a Password that must match the password entered in the main menu of Periscope on the desktop or laptop PC. There is also the opportunity to enter an IP address to initiate a connection from the Windows Mobile device. 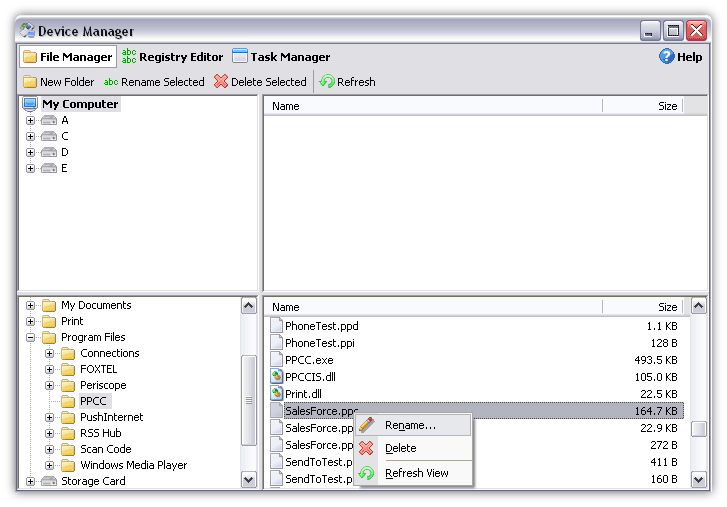 Connection from a remote Windows Smartphone via a mobile phone network enables remote management of the Smartphone. When Periscope is running on the Pocket PC a small Periscope eye icon will be shown on the bottom right of the Today screen for access to Periscope Remote, Display and PowerPoint functions described below. 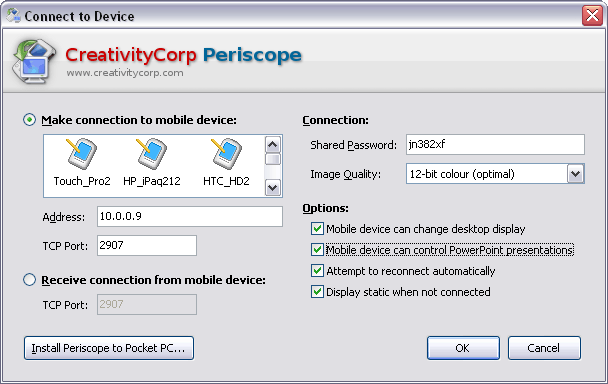 Once Periscope is running on a Windows Mobile device, the Periscope software can be run on a desktop or laptop PC to receive the screen remotely using password protected TCP/IP connectivity, either via wireless (WiFi and Bluetooth), wired connection or via the mobile phone system. 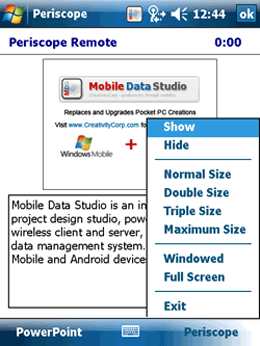 On opening Periscope on a desktop or laptop PC, the Connect to Device main menu will open and with TCP/IP channel open, the Make connection to mobile device window will show a connected Windows Mobile device image; tap the image to launch Periscope. If a mobile device icon doesn't display, check Windows Firewall Exceptions and include program 'CreativityCorp Periscope'. To connect via ActiveSync and Windows Mobile Centre, make a USB cable link connecting Windows Mobile device and desktop or laptop PC and an ActiveSync icon will appear, tap the icon to connect and then another icon with the name of the mobile device will appear. Note, the USB cable is making a TCP/IP connection in the manner described here and above; generally, it is not necessary to have ActiveSync or Mobile Device Centre running to make the 'wired' connection. Once a connection has been established and the image on the Windows Mobile device screen is visible in Periscope on the desktop or laptop PC, several options are available to adjust the image. Right-click the window to display the popup opposite. The Smartphone or Pocket PC screen is significantly smaller than the average PC or laptop display, so Periscope offers three levels of magnification to improve projection visibility. 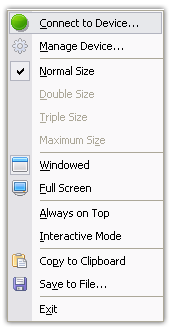 The Normal, Double and Triple Size options magnify the image by a constant factor, while the Maximum Size option used in Full Screen mode determines the largest magnification factor that will fit on the screen. Note the availability of Double Size and Triple Size may be limited with high resolution WVGA and VGA screens, with Normal Size and Maximum Size the options. In some situations it is convenient to have the SmartPhone or Pocket PC screen displayed in a window on the PC, so that other programs can be viewed and operated simultaneously. This is possible using Periscope's Windowed option. During most presentations, however, it is more visually appealing to have the image displayed Full Screen which enables projection of the Pocket PC at Maximum Size and with high contrast. When in the Windowed mode, the Periscope window can be set Always on Top, to prevent it from becoming hidden behind other windows, such as a PowerPoint presentation. Periscope provides Save to File (as .png) and Copy to Clipboard functions to assist in the preparation of screen-shots of the SmartPhone or Pocket PC. The copied image can be pasted into an image editing program. In some situations when demonstrating using a SmartPhone or Pocket PC, its more convenient to use a standard mouse and keyboard to interact with the software, rather than the touch screen. Periscope makes this possible using Interactive Mode. When Interactive Mode is enabled via the popup menu, mouse clicks and key-presses within the Periscope window will be transmitted to the Windows Mobile device, which will interpret them as taps to the screen and character input. When performing a presentation it is most convenient to control everything from a wireless Windows Mobile SmartPhone or Pocket PC that can be carried about, rather than having to directly 'hands on' interact with a fixed laptop or desktop PC. 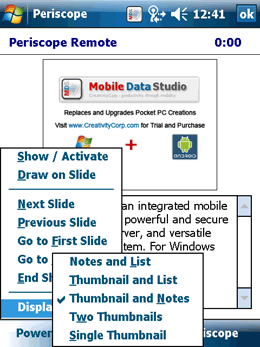 Periscope remotely controls the projected Pocket PC display, and optionally a Microsoft PowerPoint presentation, from the Smartphone or Pocket PC. The pop up menu from the Periscope icon presents options for control of the display of the Pocket PC screen when projected on or from a desktop or laptop PC. To launch an open PowerPoint presentation on a desktop, click the Go to First Slide option on the PowerPoint menu. Display Mode on the Periscope menu presents a sub menu with five PowerPoint presentation options, for maximum control, see opposite. Where buttons are available, the presentation can be run by using the left and right hardware buttons. The up and down hardware buttons within Periscope Remote scroll through the speaker notes. Periscope supports remote drawing on PowerPoint slides using the Smartphone or Pocket PC stylus. Within the PowerPoint menu, simply tap the Draw on Slide option to open drawing mode. In this mode, a full screen landscape view of the active slide is displayed to sketch on. Using the stylus, tap and drag to draw -- strokes will be transmitted and recreated on the desktop or laptop PC, using PowerPoint's pen colour settings. To return to portrait view and erase drawing, tap OK.
Periscope 3 has powerful new functions to manage remote Windows Mobile Smartphones via the mobile phone network. These functions can be used to install software such as Pocket PC Creations on a distant Smartphone and to provide assistance to a user in the field. To use the Manager for a distant Smartphone, the option in the main menu on the desktop PC to Receive connection from mobile device is enabled and the IP address of the desktop PC is entered in Periscope on the Smartphone to connect from the Smartphone to Periscope on a desktop PC. When the remote Smartphone has connected it displays in the connection window and can be selected to launch Periscope. Periscope Device Manager is also a valuable tool for managing SmartPhones and Pocket PCs in the office using local wireless or wired connections. Care should be exercised when editing the Registry. File manager makes moving files to and from Windows Mobile devices easy, simply 'drag and drop'. 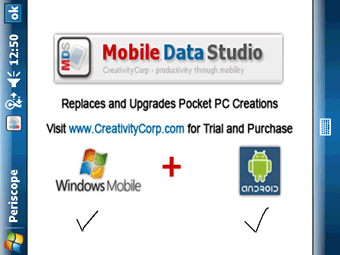 Editing the Registry enables customisation of a Windows Mobile device. However, care should be exercised when editing the Registry, and a backup should be made before editing to enable recovery after testing changes. 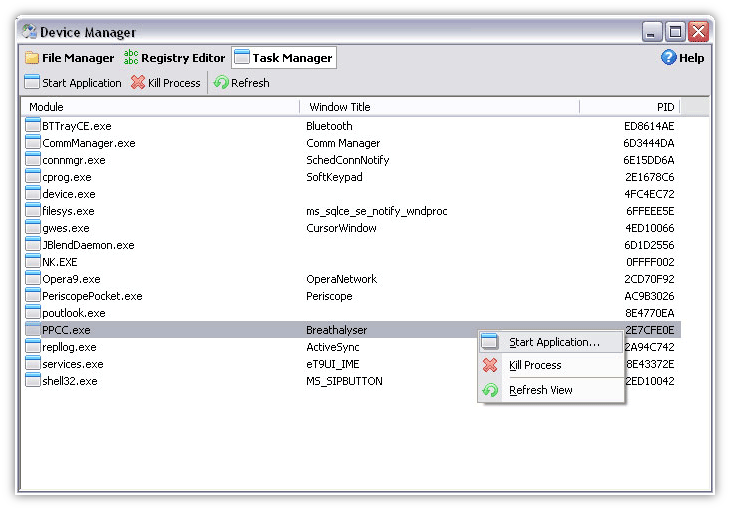 Task manager enables deeper and remote control of Windows Mobile device programs and functions. Please enjoy a free unlimited trial of Periscope 3.0, with all features included. Periscope runs in all Windows Mobile operating systems (which are Windows Mobile 6.5, 6.1, 6.0, 5.0, 2003 second edition) on touch screen SmartPhone and Pocket PC devices. The PeriscopeSetup.exe file will be located in the 'Downloads' folder on your computer if you chose the Save location suggested before download. Close other programs which may be open before installing. Double click the file and it will unpack to install on your desktop or laptop computer. Go to 'All Programs' on your desktop/laptop PC and find the 'CreativityCorp Periscope' link to open Periscope main menu below, enter a Shared Password of your choice, connect the Windows Mobile device via ActiveSync or by Mobile Device Centre and click Install Periscope to Pocket PC. On the SmartPhone or Pocket PC, locate 'Periscope' in the Start listing or Program menu, once started, a Periscope eye icon will appear at the bottom of the Today screen, with a menu to control Periscope. On the desktop/laptop PC, locate Periscope in the All Programs list.